Taking the Shapeabilities® Collection to a whole new level with their newest technology, Imperial Gold. 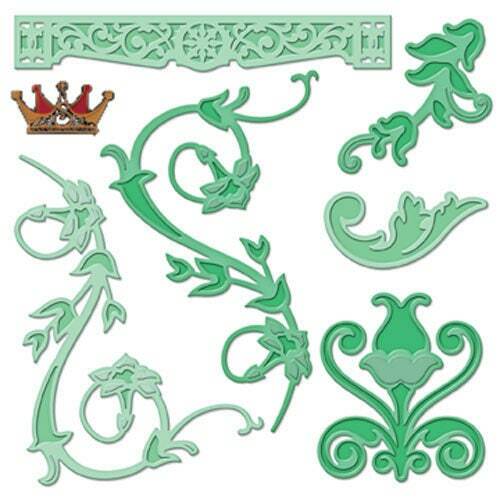 This amazing set of six die templates is full of wonderful intricate embossing and debossing designs that was inspired by the designs of older buildings from archways tocolumns. A wonderful addition for those who love details such as in these designs. Spellbinders® Imperial Gold die templates are unique, ground breaking dies that cut, emboss, stencil and deboss, giving you the ability to cut and create in multiple layers with a single die template. This revolutionary technology brings you amazing laser-like detail and four times the creative power! NOTE: GC-015 Junior Magnetic Placement Mat (sold separately) is necessary to perfectly cut, emboss, stencil and deboss all of our Imperial Gold die templates. Cut and Emboss Sandwiches are as follows: Cutting Sandwich (stack from bottom to up): 1. Spellbinders® Base Plate A; 2. Spellbinders® Magnetic Placement Mat; 3. Imperial Gold die (cut ridges up); 4. Paper/Cardstock/Foil/Etc. ; 5. Spellbinders® Cutting Plate C Embossing Sandwich (stack from bottom to up): 1. Spellbinders® Base Plate A; 2. Imperial Gold die (cut ridges up & media still inside); 3. Spellbinders® Tan Embossing Mat; 4. Spellbinders® Embossing Plate B.